FOR IMMEDIATE RELEASE – June 29, 2012 – Dole Fresh Vegetables is voluntarily recalling 2,598 cases of bagged salad. 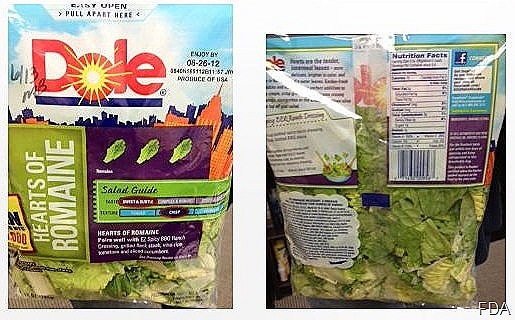 The product being recalled is Dole Hearts of Romaine coded 0540N165112A or B, with Use-by date of June 26 and UPC 7143000956 due to a possible health risk from Listeria monocytogenes. Dole Fresh Vegetables is coordinating closely with regulatory officials. No illnesses have been reported in association with the recall. The product code and Use-by date are in the upper right-hand corner of the package; the UPC code is on the back of the package, below the barcode. The salads were distributed in nine U.S. states (Alabama, Florida, Georgia, Maryland, North Carolina, Pennsylvania, South Carolina, Tennessee and Virginia). No illnesses have been reported in association with the recall. This precautionary recall notification is being issued due to an isolated instance in which a sample of Dole Hearts of Romaine salad yielded a positive result for Listeria monocytogenes in a random sample test conducted by the FDA. No other salads are included in the recall. Only the specific Product Codes, UPC codes and June 26, 2012 Use-by date identified above are included in the recall. Consumers who have any remaining product with these Product Codes should not consume it, but rather discard it. Retailers and consumers with questions may call the Dole Food Company Consumer Response Center at (800) 356-3111, which is open 8:00 am to 3:00 pm (PT) Monday – Friday. Although the product is 3 days past its Use-by date and it is highly unlikely that any product is still available at retail, retailers should check their inventories and store shelves to confirm that none of the product is mistakenly present or available for purchase by consumers or in warehouse inventories. Dole Fresh Vegetables customer service representatives are already contacting retailers and are in the process of confirming that the recalled product is not in the stream of commerce. Listeria monocytogenes is an organism that can cause foodborne illness in a person who eats a food item contaminated with it. Symptoms of infection may include fever, muscle aches, gastrointestinal symptoms such as nausea or diarrhea. The illness primarily impacts pregnant women and adults with weakened immune systems. Most healthy adults and children rarely become seriously ill.
FOR IMMEDIATE RELEASE -June 29, 2012 – New York State Agriculture Commissioner Darrel Aubertine today warned consumers in the metropolitan New York area, including Queens, the Bronx, and Brooklyn, to not consume certain “Queso Fresco, Fresh Cheese” products made by Mexicali Cheese Corp. located at 91-52 87th Street in Woodhaven, New York due to possible Listeria contamination. The product is packaged in a rigid 14 oz. plastic tub that displayed the plant number 36-0128 and a code of 071512. This consumer warning affects all packages with this code. The product was packaged in containers bearing the following product names: Mexicali Queso Fresco Mexicano, Mexican Style Fresh Cheese; or Acatlan Queso Fresco, Fresh Cheese. A routine sample of the cheese, taken by an inspector from the Division of Milk Control and Dairy Services on June 20, 2012, was subsequently tested by the Department’s Food Laboratory and discovered to be contaminated with Listeria monocytogenes. On June 25, 2012 the manufacturer was notified of a preliminary positive test result and voluntarily recalled the product from their customers. Test results were confirmed on June 29, 2012. Subsequent samples will be taken to verify that the product is free of pathogens. Listeria monocytogenes is an organism which can cause serious and sometimes fatal infections in young children, frail, or elderly people and others with weakened immune systems. Although healthy persons may suffer only short-term symptoms such as high fever, severe headaches, stiffness, nausea, abdominal pain and diarrhea, Listeria can cause miscarriages and stillbirths among pregnant women.